We will keep this introduction short and sweet because the recipe is a bit long. Please don’t be intimidated by the long list of ingredients and directions. This recipe is easy to make, especially if your timing is right. We provided detailed instructions to help you perfect the cook times required so all of your ingredients come together at once! Mix the tofu marinade in a Tupperware, slice your tofu squares into thirds and add the tofu to the marinade. Shake lightly to evenly cover the tofu and let the tofu marinade in the fridge for a minimum of 20 minutes. When the tofu is finished marinating, pre-heat the oven to 350° F.
Remove the rice from heat and place a clean towel over the pot and place the lid back on top and let stand for 10 minutes. This will remove excess moisture and create perfectly fluffy rice. Spread out the sesame seeds and flour on a small plate. 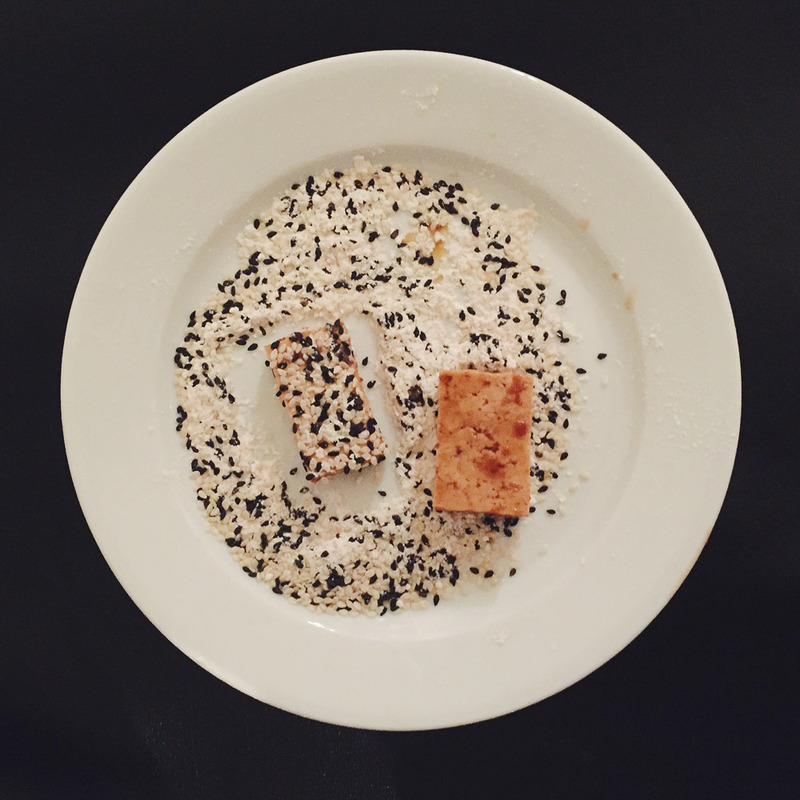 Remove one tofu square at a time and pat it on the bed of sesame seeds, coating the top and bottom. Place the coated tofu on a greased baking sheet and continue with the rest of the tofu squares. Bake for 30 minutes flipping halfway through. While your tofu cooks and rice simmers prep your veggies. We like to keep our veggies separate because they have different cook times. About 15 minutes before your rice and tofu are ready, heat a large, oiled skillet to medium-high heat. Add the pepper and cook for 3 minutes next add the sliced onions and cook for an additional 5 minutes. Add the cabbage, and then two minutes later add the mushrooms, continue cooking for 3 minutes. Stir the veggies with each ingredient you add. Prepare the stir-fry sauce in a small bowl and set aside. Add the broccoli and the sauce to the veggie mixture and give it a good stir to distribute the sauce. Cover with a lid and remove from heat. Let stand for 5 minutes. There are many ways to serve this meal. 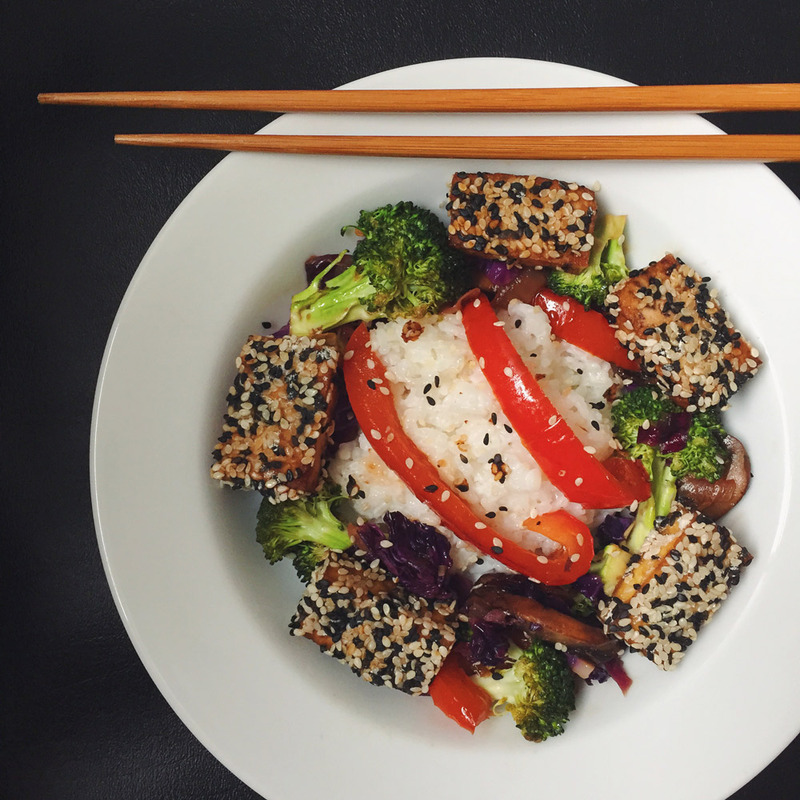 We topped the coconut rice with the stir-fry mixture and tofu. You could also toss all of the ingredients in a large bowl and serve from one bowl. Enjoy!